Kalibendo Waterfall is one of the interested place to visited in Banyuwangi Tourism that located in the Kampung Anyar village of Glagah District, Banyuwangi. 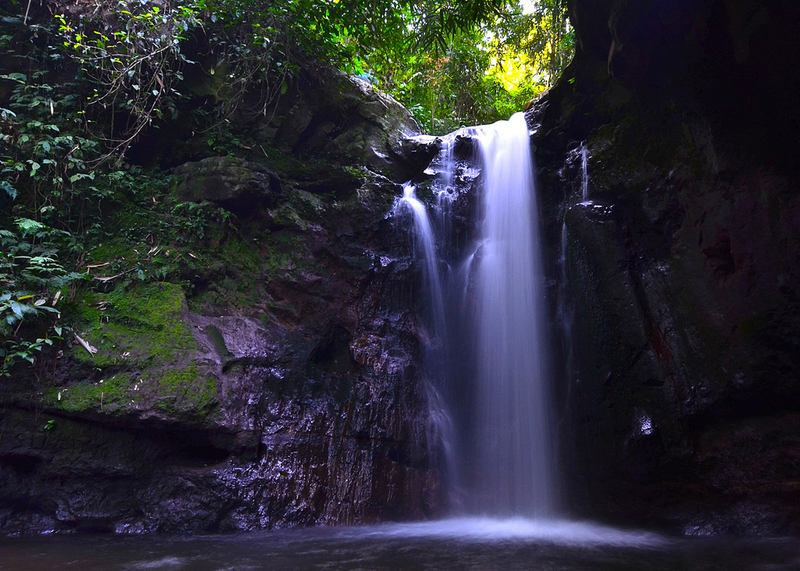 This waterfall has 10 meters height and is located in the Kalibendo Agro Tourism region. Kalibendo Waterfall closed to Coffee Plantation, Rubber and Cloves and it precisely located at the foot of Ijen Volcano. The journey from Banyuwangi to Bendo River Waterfall is 1 hour drive. It is located in the northern city of Banyuwangi, the same direction when we go to Kawah Ijen or Ijen crater. 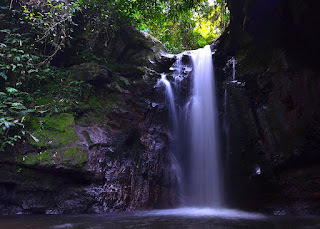 During the journey to Kalibendo waterfall, from downstream to upstream, the visitors must follow the river with approximately 500 meters. Because the river is shallow, we do not have to worry about being drifted or sinked. After passing little stream flow, we will finally reach the waterfall. After entering the gate of PT. Plantation Kalibendo Waterfall, You can park your vehicle in parking lot have provided in front of the conference hall. From this parking, start soft trekking along the path past the clove plantations and Bendo trees. The path condition is still contour form of land decreases and winding. Furthermore, You will arrive at Kalibendo river with a bridge over it. After crossing a wooden bridge width 1 m above the river seemed endless hills and heterogeneous plants. On parking lot section is mostly found several stalls that provide food and beverages. The journey of Kalibendo Waterfall continues still pass the path trail along the cliffs on the top side approximately 300 m to the west until arriving at the Kalibendo river again. And finally follow the flow of the river to follow it until arriving at the waterfall site a few hundred meters further. Enjoy Kalibendo Waterfall Tour is very convenience If you cambine your holiday with Ijen Crater Tour that still in Banyuwangi Attraction. The other tourism object around Kalibendo is G-Land Plengkung Beach, Blue Flame Ijen Crater tour, Green Bay, Sukamade Beach and still many more. The nearest way to reach Kalibendo Waterfall is from Banyuwangi Harbor or Bali, If you start your vacation from Surabaya, You can stop at Lumajang to enjoy Tumpak Sewu Waterfall tour, Tumpak Sewu Waterfall is the most popular Waterfall in Java Island, but You must start in the morning because the Kalibendo waterfall location is more far than Tumpak Sewu Waterfall. Beside of Kalibendo Waterfall Tourism, You can find some popular tourism around Java Island of Indonesia, For other interested places, You can read detail of combination tour package below. Kalibendo Waterfall is one of Banyuwangi Tourism has been a part of attraction in Java, Indonesia. If you need more information Bromo Sunrise Tour, Bromo Tour Price and Facaility, You can visit Our Contact.